Groupthink is a problem that affects many organisations. Not only do certain ideas take hold and become accepted as 'truth' but certain ways of thinking about things can also become entrenched. The article below discusses the benefits of 'cognitive diversity' or how individuals thinking differently can help teams to solve problems. This kind of advantage is key in a world where innovation is one of the best ways to maintain a competitive advantage. But this does create other challenges for teams, particularly for those trying to influence within a team. 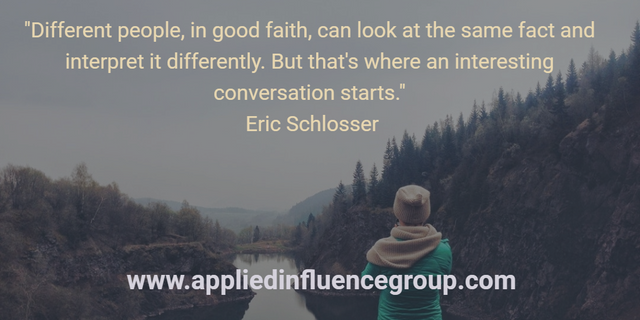 At Applied Influence Group we believe that the best way to influence, is to present your perspective in a way that makes the most sense to the other person. This is why empathising with someone else's situation, experiences and outlook on life is so important. Empathy based on an understanding of someone else's thought processes becomes much more difficult though. There are far fewer visual cues that the other person thinks differently, making this kind of diversity largely invisible. Recognising that these differences exist within teams is the first step to influencing in these situations. It allows us to try presenting information and ideas in ways which might be counter-intuitive to us but that may resonate with others. We can then start to work out what works with different individuals and build it into our framework of understanding them. Tackling new challenges requires a balance between applying what we know and discovering what we don’t know that might be useful. It also requires individual application of specialized expertise and the ability to step back and look at the bigger picture. A high degree of cognitive diversity could generate accelerated learning and performance in the face of new, uncertain, and complex situations, as in the case of the execution problem we set for our executives. Based on these indicative findings, we are continuing our research with a larger sample.